1954 - A Part of Me. Vinyl LP. Bleep. 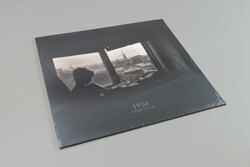 Project Mooncircle (My Panda Shall Fly, Flako) front the debut full-length from Lyon-based artist Ivan Arlaud aka 1954. A Part Of Me is an LP of densely-crafted, emotional electronica. Tracks like ‘It Was Love’ and ‘Flowers Of The Dead Man’ come off like James Blake’s instrumental music if Blake didn’t leave so much space in his sound. Sampled drum breaks, deep-pitched vocals and mournful piano tracks flit around programmed drums and bass that hover between hip-hop, downtempo and Hotflush-era Mount Kimbie. Though vocals are often woven into the fabric of 1954’s sound, there are moments where singers take centre-stage - the neo-soul number ‘Blue Boy’ features a fine turn by Loup Na.